WORKS FOR ALL SAMSUNG PHONES. WORKS ON HTC LG SAMSUNG. DUAL USB - ADAPTIVE FAST AND NORMAL 2.1A. We'll be more than happy to satisfy you. Compatibility: Samsung Galaxy S7, S6 G920 & S6 Edge G925, Samsung Galaxy S6 Edge Plus, Note 4, Note Edge, Note 5. Lightweight and compact. Fused, surge protected & CE approved. Color: White. High charging efficiency. Output Current Approx - 15W ( 9V 1.67 ) per port Connections - 1 x USB 2.0. This is 100% Genuine, not a Replica. This is an original Product. We insist on the original for unparalleled quality. A3 2017 A5 2017 A7 2017 S8 S8 S9 S9 . Output Current Approx - 15W ( 9V 1.67 ) per port Connections - 2 x USB 2.0. USB Type C Connector Compatible Models: Galaxy NOTE8/S8/S8 Plus, S9/S9 Plus, LG G5, LG G6, OnePlus 2, OnePlus 3, OnePlus 5, Nexus 6P, Nexus 5X, Microsoft Lumia 950/950XL, Google Pixel/Pixel XL, and many more. 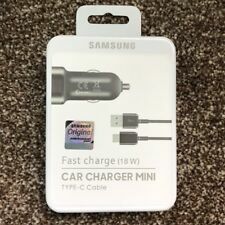 1 x Official Samsung USB Type-C USB data cable (EP-DG950CBE). 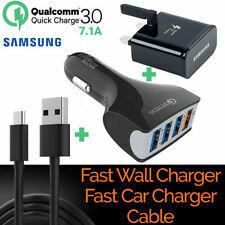 New double car charger with micro cable. Same day dispatch if you have paid before 2pm. Any questions feel free to ask. New Samsung Galaxy S8 S8 Plus Note 7 Samsung Galaxy A3 A5 A7 And With All Type-C enabled devices. Compatibility / Samsung Galaxy Phones Colour: Black. Samsung Galaxy Note7. Small,Compact,Sleek,Portable. USB cable: micro usb to usb. Cable Length: 1M. Color: White. Output: 9.0V=1.67A; 5.0V=2.0A. • Direct Cigarette Lighter Connection. 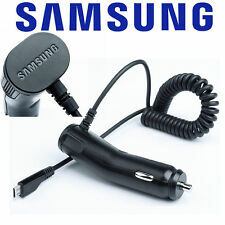 Genuine CE High Quality Micro USB Car Charger for Android HTC Samsung Phone. 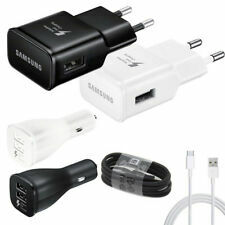 Or Type C cable for S9 etc Not included. : Samsung Galaxy S6/S6 Edge, HTC M9, Nexus 6, HTC Butterfly 2/HTC One M8, Moto X, Galaxy Note 4/Note Edge, Sharp Aquos Zeta/Aquos Tab,Sony Xperia Z2/Z3/Z3 Compact/Z2 Tablet/Z3 Tablet Compact, LG G4, etc. Cradle holds your phone securely during long rides. Vehicle mount holder. Attach it to the windshield or dashboard and adjust the multi-angle neck for perfect viewing. 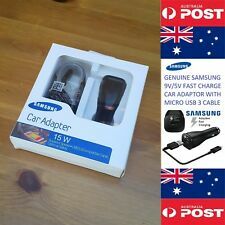 Plug in to any 12V cigarette lighter or other 12V socket. Suitable for the follow Samsung Phones.